Innovations Kapital is a leading independent early stage venture capital firm for innovative growth companies in the Nordic region. InnovationsKapital was founded in 1994, on the initiative of Chalmers University of Technology, in order to invest in start-up and early-stage high-tech companies. Their primary focuses are Information & Communications Technology (ICT) and Healthcare & Life Sciences companies and, since 1994, have made over 60 investments in those sectors. 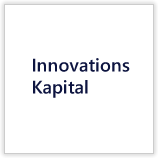 InnovationsKapital Nordic Advisors AB is an independent management company and currently advises four venture funds aggregating EUR 317 million in committed capital. The capital is provided by highly reputable Swedish and international investors. They invest in start-up, early-stage, or early expansion stage companies, in the Nordic region (Sweden, Denmark, Finland & Norway). Jacobs Capital Group is a global fund-of-funds that was established to assist in changing the venture capital model on a global basis and to promote entrepreneurship by building new ventures faster, broader, globally and with less risk. If you would like to submit a Private Placement Memorandum (PPM) or executive summary to be considered for financing, please visit our proprietary deal entry system, MyDealVC.com (beta), and create your personal profile. From there you will be able to enter the PPM, load attachments, and maintain updates.